Spending Christmas in one of the log cabins down at our private lake is a magical experience. Being in a traditional log house with its own log fire, wooden hot tub and Scandinavian luxury makes for a very memorable festive period – we’ll even decorate the Christmas tree in time for your luxury short break in the UK. Our authentic Scandinavian lake retreats come in a few different sizes so we can cater for all groups, whether there’s just the two of you or you want to bring the whole family. So get ready to unwind and enjoy a special festive break with us this coming December. Everyone loved spending Christmas in our Swedish log cabin – we felt like we had really escaped for some luxury! Book your stay on our private lake and enjoy total seclusion and mind-blowing winter views from your cabin window. Our luxury lodges sleep from 4 up to 11 people and they are all hidden away in their own secluded spots in our 130 acre reserve. If you want to plan a big Christmas for extended family, we recommend booking more than one cabin; they’re all just a short walk, boat ride or drive away from one another. Not only do our cabins all come with large open plan living spaces, fully equipped kitchens and a cosy log fire, but they are authentically sourced from Finland so they’re super warm in the winter time. Besides, kids will just love the excitement of staying in a log cabin that comes from the same place as Santa! Avoid the hassle of making up beds, cleaning the house or decorating the tree. All of these things will be arranged for your arrival. All bedrooms are made up with luxury bed linen and can be requested as either doubles or singles, and we’ll even have a beautifully decorated Christmas tree waiting for you to place your presents under! Each cabin has a collection of books and board games to keep everyone entertained and there’s so much to do on our reserve. You can even order an online food shop and have it delivered to your private cabin so you won’t have to venture far for anything. Though there are lots of amazing farm shops nearby that are worth the trip if you want to try some local produce. 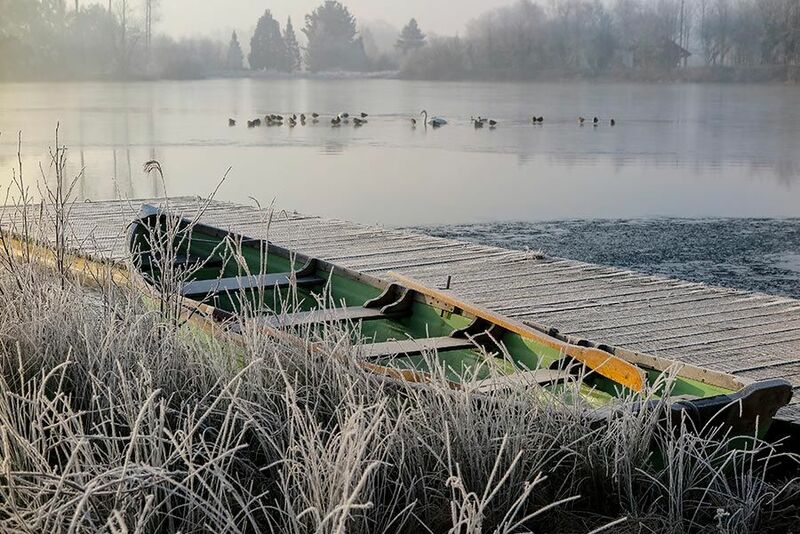 Each lodge comes with its own 19ft Irish rowing boat which can be used to explore the lake, and the lake really is beautiful in wintertime. Perfect for romantic short breaks! We can help you arrange bikes so you can explore our private 2.5 mile lakeside trail and other picturesque routes in the surrounding Cotswold region. Plus there’s plenty going on in the Cotswolds throughout December so make sure you read our Travel Guide for the Cotswolds and check out our holiday ideas blog to start planning your Christmas break.